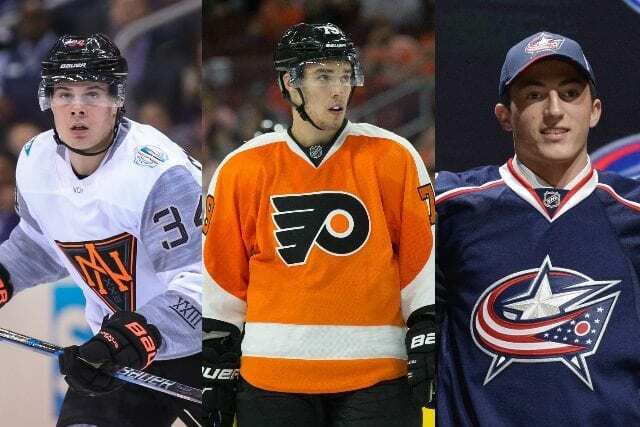 In today’s NHL young players are being relied upon more heavily to make an impact than ever before. With that in mind, and the 2016-17 season just around the corner, let’s take a look at the top 10 Calder candidates for the upcoming year; not necessarily in order. Matthews seems to be the consensus pick for the Calder and, really, it’s pretty easy to see why. As an 18-year-old Matthews was absolutely dominant no matter what team he was playing for. He registered 11 points (seven goals, four assists) in seven games for USA at the World Juniors. He tallied nine points (six goals, three assists) in 10 games playing for USA at the Worlds. Matthews was outstanding overseas as he scored 24 goals and tallied 46 points in 36 games while playing against men in Zurich. He has also been remarkably impressive for Team North America despite playing against tons of high-end NHLers at the World Cup of Hockey. Matthews is big, strong, he can skate, he has great hands, he creates for his teammates and he can put the puck in the net. Playing for an up-and-coming Toronto team, he’ll be given ample opportunity to shine and he will do just that. I think the Matthews-Laine debate was more media driven than anything else, but that is definitely not a knock on Patrik Laine. Laine is a good skater, possesses an absolute cannon of a shot and already has an NHL build at 6’4′ and 210 pounds. Like Matthews, he was fantastic playing in Europe (but in the Finnish Elite League), fantastic at the World Juniors and has also impressed at the World Cup. He is ready to make meaningful contributions at the NHL level right now and given the forward talent he has to work with in Winnipeg, he should have no problem doing just that. Puljujarvi seems to be flying under the radar when talking about Calder candidates, but there’s certainly reason to be optimistic about the impact he can make as a rookie in Edmonton. Puljujarvi was a regular contributor for Karpat in the Finnish Elite League, especially in the playoffs, and was perhaps the biggest reason Finland won World Junior gold as he posted a ridiculous 17 points in seven games. He has been getting rave reviews by media covering the Young Stars tournament in Penticton, too, and has everyone convinced he is ready to contribute at the NHL level. Forget wondering about if Puljujärvi might break camp with Edmonton, the way he’s played this weekend he could break camp with the Avengers. Jesse Puljujärvi has been as thoroughly dominant as any player I’ve ever watched at the Penticton Young Stars tournament. Should Puljujarvi crack Edmonton’s lineup, and there’s no reason to believe he won’t, he will always be centered by one of Connor McDavid, Ryan Nugent-Hopkins or Leon Draisaitl, assuming that trio stays healthy. There are worse situations to be in. A good case could be made that William Nylander was NHL ready a year ago, but the Toronto Maple Leafs elected to send him back to the Marlies to a) give him more seasoning; b) prevent him from hurting the team’s tank job and; c) avoid burning a year towards unrestricted free agency. The Leafs appear to have made the right decision. Nylander took the AHL by storm registering 45 points in 38 regular season games prior to being recalled by the big club. Nylander continued to produce with the Leafs, albeit not quite as much, tallying 13 points in 22 NHL games before returning to the AHL for a long playoff run. There is no doubting Nylander is an elite talent. With some NHL experience, an improved supporting cast with the big club, and another summer of training under his belt, Nylander seems poised for big things in 2016-17 and beyond. The Avalanche gave Rantanen a nine-game tryout last season. He was held pointless and struggled in possession, so they elected to send him to their AHL affiliate in San Antonio. Rantanen was stellar from start to finish in San Antonio. Despite playing in just 52 regular season games, he led the team in goals with 24, in points with 60 and was named to the 2015-16 AHL All-Rookie Team as a result. Rantanen may miss the start of the season due to an ankle injury but it’s nothing that should keep him out long-term. When he returns I fully expect him to establish himself as a quality NHL player. It’s very hard for young blue liners to win the Calder Trophy in today’s day and age but one guy who could make things interesting is Zach Werenski. Werenski was spectacular for Michigan last season as he logged a ton of minutes in all situations and put up crazy numbers (for a defenseman) registering 36 points in 36 games. For comparison sake Shayne Gostisbehere put up 34 points in 42 games during his final season in college and we saw how he turned out. Gostisbehere was a year older than Werenski was, too. Following his dominant season in Michigan, Werenski turned pro and put up 14 points in 17 games for Lake Erie en route to an AHL title. The Blue Jackets’ blue line is less than spectacular so Werenski should have no problem earning a big share of minutes. As mentioned above it’s very difficult for rookie defensemen to perform well enough to be seriously considered for the Calder Trophy. Shayne Gostisbehere was able to do just that that last season and, luckily for the Flyers, they have another guy who may be able to buck the trend in Ivan Provorov. Following an absurd draft season where Provorov averaged more than a point per game for the Brandon Wheat Kings, there was talk Provorov was ready for NHL duties in 2015-16. The Flyers elected to send him back to Brandon for another year of seasoning and it will almost certainly pay off. Last season Provorov put up a ridiculous 21 goals and 73 points in 62 regular season games while logging a ton of minutes for the Wheat Kings. There is a spot for the taking on the Flyers’ blue line and there is little doubt Provorov is ready to grab it. The Flyers may try and ease him into the lineup, but I don’t think it will be long before Provorov is logging 20+ minutes a night. The depth on the Anaheim Ducks’ blue line certainly won’t help Theodore’s cause, but I think he is ready to be an NHL regular. In part due to injuries, Theodore was able to get into the lineup for 19 regular season games and he fared pretty well. Theodore tallied three goals and eight points while averaging about 19 minutes per game for the Pacific Division champs. Theodore’s underlying numbers were pretty good, too. Despite spending almost half of his minutes with Clayton Stoner and Cam Fowler, who is not good in possession, the Ducks just about broke even in the shot attempt battle while scoring 75% of the goals with the then 20-year-old on the ice. His strengths are skating, moving the puck, and quarterbacking the power play. Again, the Ducks’ depth on defense will hurt him, but I think Theodore is a guy we’ll hear a lot about moving forward; if not this year then next. Roster spots are earned, not given, but there are vacancies down the middle wide open for the taking in Arizona and the plan seems for Strome to take one of those spots. Despite Erie losing Connor McDavid, which meant Strome would be keyed on every single night, Strome tormented the OHL last season recording 37 goals and 111 points in 56 regular season games. He carried that success into the playoffs, too, tallying 10 goals and 21 points in 13 games that included a four-game sweep by the powerhouse London Knights. Realistically Strome’s skating, and saving a year on his entry-level deal, were the two main reasons he wasn’t in the NHL a year ago. With his skating noticeably better, and the Coyotes now heading in the right direction, there’s nothing preventing him from being a full-time NHLer this season. As an 18-year-old Aho led Karpat of the Finnish Elite League in goals (20), points (45) and playoff scoring (15 points). All included, he put up an unheard of 24 goals and 60 points in 59 regular season and playoff games. Despite those absurd totals, Aho has flown under the radar. Why? He was a 2nd round pick so he doesn’t carry the hype many top prospects do. He also played overseas so those in North America haven’t seen him beyond a handful of games during the World Juniors. Then there’s the fact he was drafted by a small market team so there wasn’t nearly as much media hyping him up as there would be if he played in Toronto, for example. In a year’s time he has emerged as one of the top prospects in hockey and he is all but a lock to make the offensively starved Carolina Hurricanes as a top-6 forward. Honorable mentions for the Top 10: Mitch Marner, Pavel Buchnevich, Pavel Zacha and Kyle Connor.